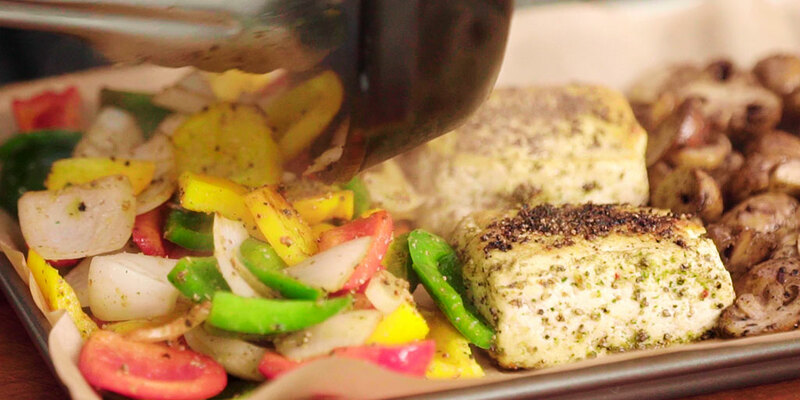 In this recipe we’re going to teach you how to make delicious whole roasted vegan tofu! 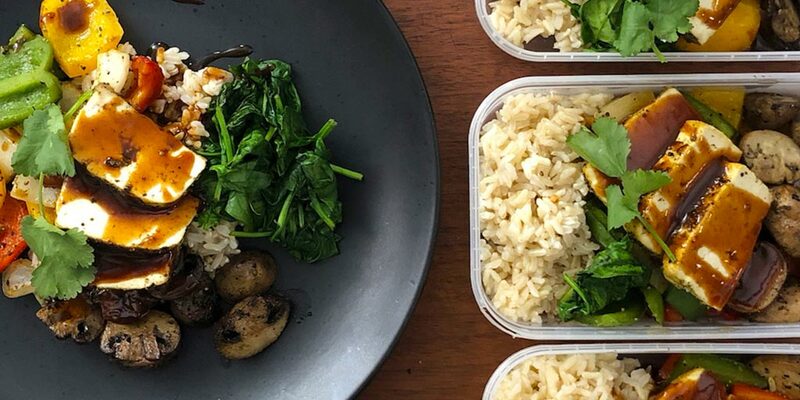 This plant-powered dish is high in protein with minimum fuss and maximum flavour! Our method for making mouthwatering roast tofu is wicked easy and wicked quick for fellow Plant Pushers of all skill levels. Let’s get cooking! Before we get into the recipe, we are excited to announce that we’ve teamed up with www.milliondollarvegan.com to fight climate change with diet change! 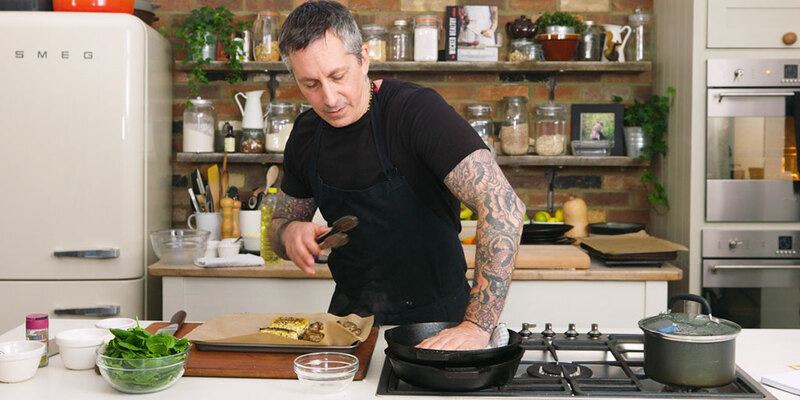 You can watch the first episode of The Wicked Kitchen and cook along with me (Derek) as I show you step-by-step how to make the Vegan Roast Tofu & Veg recipe described below. This Ain’t Your Grandma’s Tofu! 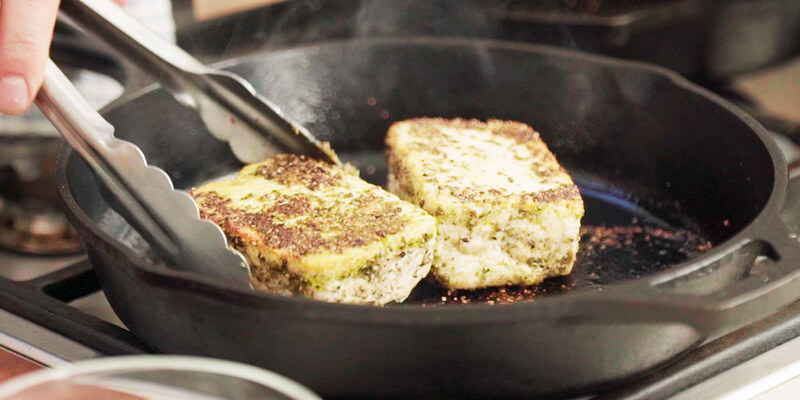 Forget what you think you know about tofu! This is next-level “FU of TO” (as only I call it) and it’s taking center stage. It’s flavour-ific, bean curd reimagined! This recipe is well-seasoned to harken back to the nostalgic Sunday roast dishes we ate as kids. And now we’ve recreated those familiar flavours the only way we know how—by giving it a wicked, plant-based twist! The results are in: it’s friggin’ awesome! Cast Iron = HEAVY: Thick cast iron skillets are the best, and we swear by them. Cast iron holds more heat than thinner aluminum alternatives, therefore making it easier to achieve a spectacular sear. 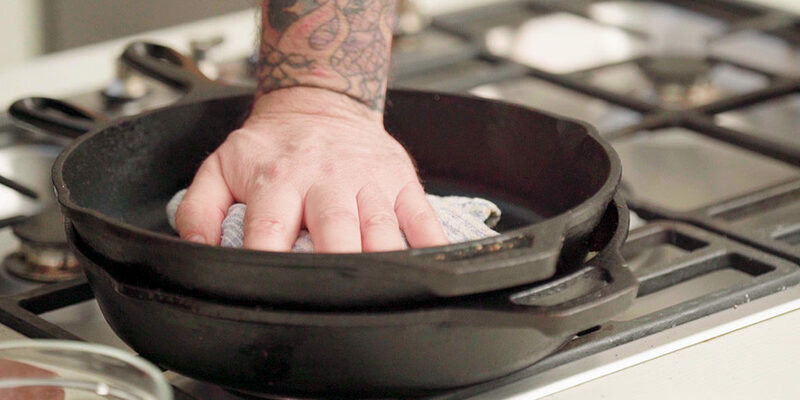 Gentle Weight: Because the cast iron is naturally heavier, we find it’s much easier to control the cooking process. You only need to use gentle weight to get the right results and the pan does most of the work! Work smarter, not harder, people! Science-y Stuff: Pressing things against a rippin’ hot surface naturally speeds along the cooking process. The added pressure drives water out, while simultaneously letting more delicious flavors soak in. It’s just science. Don’t worry if you don’t have two cast iron pans—it can still be done with two regular skillets or a combination of a pot and skillet. Just pay special attention to the thickness of the bottom pan (the one you’re cooking with) and keep an eye out for burning veg! 🔥 Thinner pans tend to burn things more easily and heat unevenly, so just be aware. As we get deeper into the series, we’ll be sharing more tips, techniques and how-to’s that are easy to accomplish with cast iron and other everyday equipment. Please share this with friends, family, and anyone that’s looking for delicious ways to eat and prepare more vegan plant-based foods. We’re chefs that have been practicing this craft our whole lives and we want to benefit you and the animals. Small steps make big changes! Thank you for supporting! Place half cut tofu into a large bowl and massage tofu with 1 tsp of oil to coat each piece. Add ‘pork’ type seasoning, salt-n-pepper, granulated garlic and gently toss to cover tofu with seasoning all over. Heat cast-iron pan on medium heat until wicked hot. Add about 2 – 3 tbsp of oil. Add tofu and sear on each side 2-3 minutes until golden crispy brown all over. Remove from skillet and place on parchment paper lined baking sheet pan. 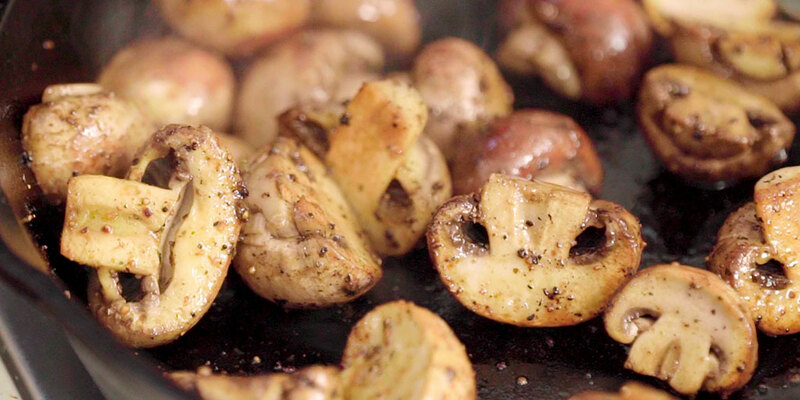 In the same hot pan, add mushroom halves face down, drizzle oil and swirl to coat. Sear for 2 minutes to brown, before stirring. Press with 2nd pan (optional). Remove from skillet. Arrange on baking sheet with tofu. Place cubed bell peppers and onion into a large bowl, add little oil, a pinch of granulated garlic, salt and pepper and lightly toss to cover evenly. Add to hot skillet. Sear peppers and onions for 2 minutes, stirring occasionally. Pressing the peppers and onion is optional to add more even browning. 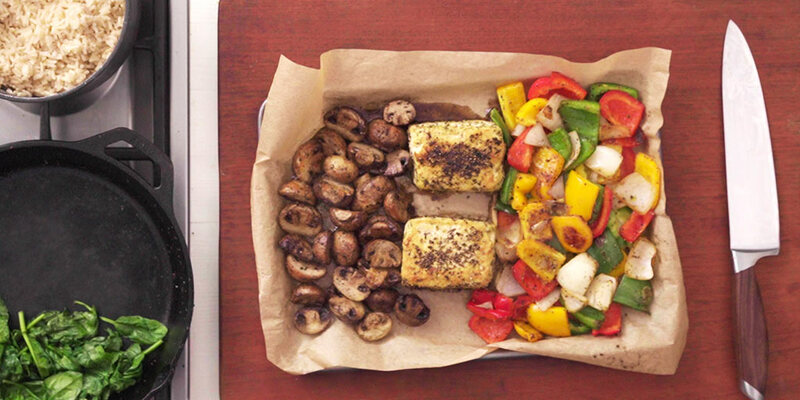 Remove from pan and arrange on baking sheet with tofu. Place baking sheet with everything in the oven and roast for 10-15 minutes. Remove from oven when done, allow to cool for few minutes before slicing tofu. In the hot skillet, add baby spinach and stir until wilted, roughly 1 minute. Remove from heat. In a separate pot or container, warm the BBQ sauce, or your favorite sauce. Plate 1-2 meals for now and pre-pack meal prep for later. Remember to reuse plastic takeaway boxes, or glass containers when available. Every little helps to reduce and reuse plastics is important!